We have had some amazing and beautiful fall weather this season and one Sunday we found ourselves on a hike at our local arboretum. The temperature was just cool enough to wear a light jacket and the kids big enough to last on a longer hike. The afternoon sun shown in between the leaves in the trees and every so often, the wind would swirl more leaves to the ground to crunch under our feet. As I shuffled through the multicolored noisy leaves, I thought about how our lives pattern after the life of leaves. When we are very young, our faith is tender and new, like the buds of a tree in spring. We are just developing in the warmth of the sun. Our faith is also very simple, like those beginning buds. They don’t need to be complicated to be lovely, filled with hope and anticipation of what the future might bring. Flowers burst from the trees as we pass through the Sacraments in our young lives. We give off a fragrant perfume as we become baptized, receive our First Reconciliation and First Communion. And then we fully blossom as we are confirmed in the faith. As we mature into adulthood, we become green like the leaves in summer. Leaves of trees are hard workers, producing food for the tree. In a similar way, our adulthood is the time when we work hard for the kingdom of God. We serve others, teach others, live as example to others in our work and play. In the autumn, as the daylight hours wane and the cooler temperatures set in, leaves change to the beautiful reds, yellows and browns that we love to see. When the sun hits them, the leaves turn landscapes on fire with their beauty. In the autumn of our own lives, we become shining examples of a lived-out faith. At this stage, we can still inspire others, but perhaps with less or more focused busyness. 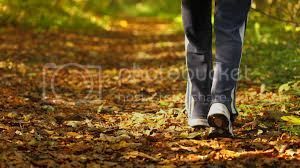 Until at last, we, like leaves from a tree, let go of this life, and what is left behind, our faith-filled legacy, is the crunch under someone’s feet to enjoy of a cool fall day.